You've Seen LEGO Movie Games. Now There's A Game Of The LEGO Movie. This isn't just an excuse to post the amazing trailer for The LEGO Movie again, I promise. That's not saying I'm not going to post it again — of course I am. I'm just posting it within the context of the oddly wonderful occasion of TT Games, the developer responsible for making LEGO video games based on popular movie franchises, making a LEGO game based off of a movie based off of the toys. It's like LEGO-ception up in here. Anyway, Warner Bros. Interactive Entertainment and TT Games will be releasing The LEGO Movie Video Game for the Xbox One, PS4, Xbox 360, PS3, Wii U, PC, 3DS and Vita to coincide with the release of the movie in 2014. That is a lot of platforms to mention in one sentence. Players will traverse 15 levels as one of more than 90 playable characters inspired by the film. The game also features something called the digital Master Building ability. 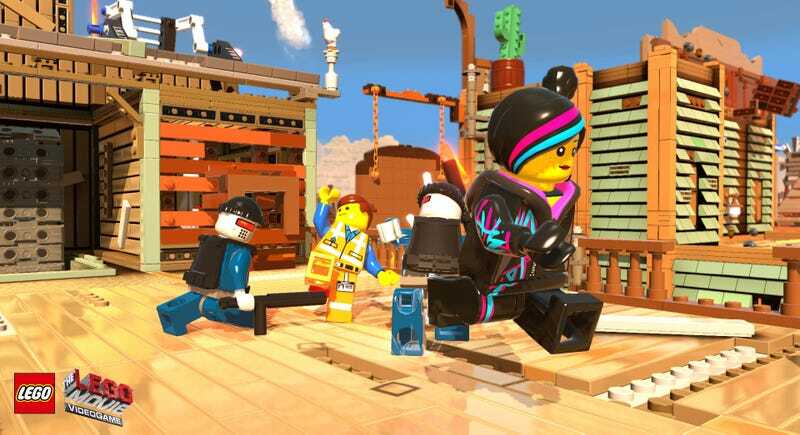 Players will be able to collect LEGO instruction pages to build sets, or "harness the awesome power of the Master Builders to virtually build extraordinary LEGO creations along the way." Not sure exactly what that means, but it sounds lovely. I was going to link the trailer five more times, but decided to go with screenshots instead.